Insurance lead generation company InsuranceFiles.com is set to celebrate Insurance Day on August 30th. “We’re excited to celebrate Insurance Day and to celebrate such an important triumph for a helpful product,” says account manager Sergey Margaryan. InsuranceFiles.com, a leading insurance lead generation company, is celebrating Insurance Day, a day that promotes insurance and safety for every aspect of life that needs insuring. To celebrate such a pertinent holiday for InsuranceFiles.com, the lead generation company sent out postcards to insurance agents across the country. Having the same beliefs and core values as InsuranceFiles.com, Insurance Day is the ideal holiday for InsuranceFiles.com to celebrate. Promoting concepts like protecting what is most important to clients and thinking ahead about risk management, both InsuranceFiles.com and Insurance Day place strong emphasis on these good decisions that help ensure a safe future. 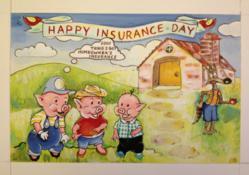 Insurance Day stems from the lessons learned after an attack on pigs by a hungry wolf. By purchasing an insurance policy, the wisest pig was able to prevent his house from being blown down, saving him from certain death. Because of this sensible action, insurance became standard, promoting both the insurance industry and the insurance lead generation industry. And in recognition of such a glorious occasion, InsuranceFiles.com commemorates these good decisions by offering $100 worth of leads for new customers once they deposit their first $100 into their account. InsuranceFiles.com is an insurance lead generation based in Encino, CA. Specializing in live transfer, exclusive, and semi-exclusive leads, InsuranceFiles.com is dedicated to helping agents find new clients using the most innovative marketing methods. With expert account managers who specialize in seamlessly integrating insurance leads into the workflow of their agents, InsuranceFiles.com has quickly grown to a leading expert in the insurance lead market.